Experience the essence of Norwegian fjords, mountains and valleys, all summed up in this round trip that can be enjoyed in peace and comfort. This round trip takes you on a journey through some of the most beautiful scenery in Fjord Norway, and includes breathtaking experiences on the Bergen Railway, the Flåm Railway, the Aurlandsfjord, the Nærøyfjord and the steep Stalheimskleiva road. Norway in a nutshell® is available starting from Bergen, Voss and Oslo all year round. 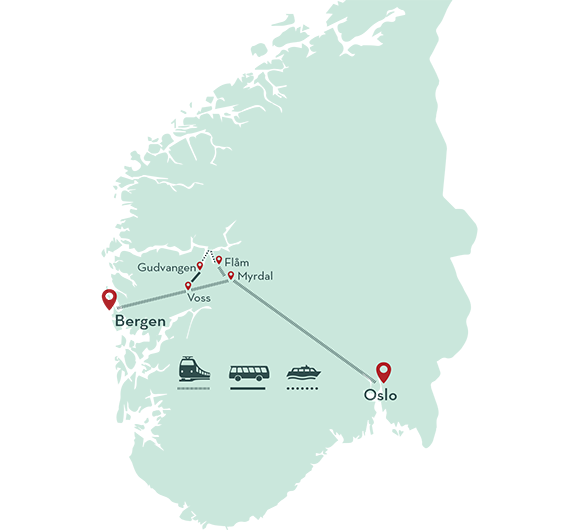 The Bergen Railway is voted one of the world’s most beautiful train journeys. The train ride over Northern Europe’s largest mountain plateau, Hardangervidda, is spectacular and varied with view of the blue ice of the Hardangerjøkulen glacier. The train journey on the Flåm Railway between Myrdal and Flåm is one of the highlights of the round trip. On the 20-kilometre long train ride, you will see some of the most magnificent mountain scenery Norway has to offer, with a shifting panorama of towering mountains and impressive waterfalls. On the fjord cruise, you travel passed the beautiful villages of Aurland and Undredal before the boat enters the Nærøyfjord, one of the narrowest fjords in Europe. 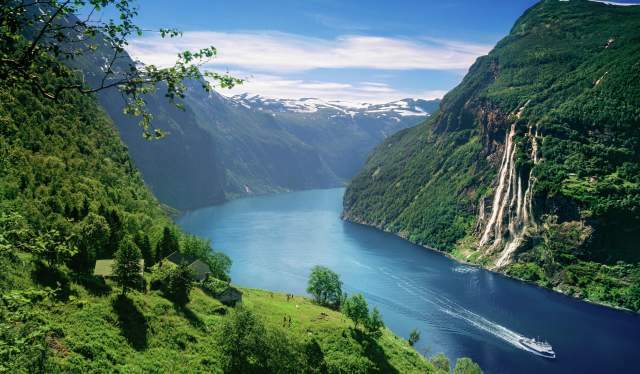 This arm of the Sognefjord is perhaps the most dramatic fjord in Norway, and is on UNESCO&apos;s World Heritage List. The Stalheimskleiva road, which twists and turns up through 13 hairpin bends offering views of the Sivlefossen and the Stalheimsfossen waterfalls, is the steepest stretches of road in Northern Europe. Stalheimskleiva is open from May to September. In the winter months, the bus takes the new road to Voss. Overnight stops are possible on all of the round trips. Try Fjord Pass®, Norway&apos;s most extensive hotel pass and get discount on accommodation in Norway. For booking and more information visit Fjord Tours at norwaynutshell.com or call: +47 815 68 222. Let Fjord Tours show you Norway’s magical fjords, mountains, waterfalls, ideal for activities like kayaking, hiking, glacier walking, bicycling and much more. Norway in a nutshell® is the most popular round trip in Norway, and can be taken from Voss, Bergen or Oslo. This unique tour includes some of the most beautiful scenery in Fjord Norway such as Northern Europe’s highest railway, the Bergen Railway, the Flåm Railway, the Nærøyfjord (on UNESCO’s World Heritage List) and the steep Stalheimskleiva Road. Season: The tour is available daily all year around. Price from $169* per person (roundtrip from Bergen). Duration around 8,5 hours. *Based on availablility and starting in Bergen, rules and restrictions apply.